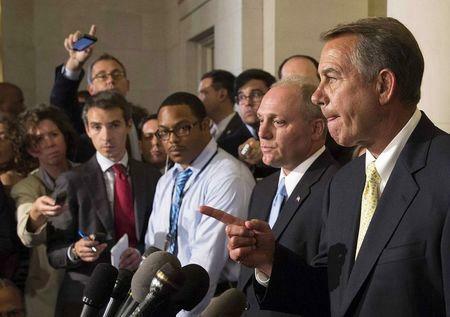 House of Representatives Republicans on Thursday chose an ally of Speaker John Boehner for the No. 2 job in the chamber, a setback for some conservatives hoping to use a leadership election to boost their influence. Representative Kevin McCarthy of California, already the third-ranking House Republican, was chosen to replace Eric Cantor as majority leader. He will control the House floor and help decide the party’s legislative priorities. Steve Scalise, a Louisiana lawmaker with backing from Southern Republicans, beat out two other lawmakers on Thursday to replace McCarthy as party whip, drumming up votes for bills. Tea Party Republicans had pushed for one of their own to join the leadership after a little-known professor defeated Cantor in his Virginia primary by accusing the majority leader of not pursuing a conservative enough agenda. Cantor will leave his position at the end of July. The race brought fresh turmoil to the caucus, as Tea Party favorites argued that Boehner and other, business-friendly leaders gave in too easily to Democrats on spending disputes. Tea Party-aligned Republicans said after the vote that they were disappointed with the outcome of the majority leader race, in which Representative Raul Labrador of Idaho lost to McCarthy. But they said Scalise could push leaders to hold their ground on key issues for conservatives, such as immigration reform and spending cuts. He has a conservative reputation and leads the Republican Study Committee, a group that includes about two-thirds of House Republicans. But he also has a good relationship with Boehner. “We really need him to whip the leadership,” said Representative John Fleming, who, like Scalise, is from Louisiana. McCarthy is seen as having similar political views to Cantor, if a more laid-back leadership style. On Thursday, he emphasized economic issues and the Republican push to repeal President Barack Obama’s signature healthcare law. “America is struggling. It’s struggling with a stagnant economy, a failed healthcare law,” he said. McCarthy’s deputy, Peter Roskam of Illinois, was one of the lawmakers Scalise defeated to take the No. 3 spot. Representative Marlin Stutzman of Indiana, another Tea Party conservative, had also sought the job. Scalise emphasized his Southern conservative roots to solicit votes from lawmakers who view Boehner’s leadership team as too moderate. On Thursday, Scalise’s aides held placards that read “Geaux Scalise,” a play on Cajun words that is sometimes used by Louisiana sports fans. Republicans leaving the room told reporters the vibe in the room was not contentious and lawmakers who introduced the various candidates kept their statements positive. “No sparks flew at all,” conservative Representative Steve King of Iowa said after the vote. Still, Representative Walter Jones of North Carolina said there was frustration among conservatives after Labrador lost, even though he said it was “at least a little bit of a shake-up” to leadership that Scalise won. The results could embolden Tea Party Republicans to push their own candidates after the November midterm elections, when the party will again select its leaders, including the House speaker. Boehner has said he plans to run again. “It’s important that we have a new look in a new Congress, should we hold the house,” Jones said. Representative Justin Amash of Michigan, a Labrador supporter, told reporters the Tea Party candidate had a strong showing. But he said it would be harder to unseat current leaders after the midterms. “I think this was our best shot to change leadership,” he said.